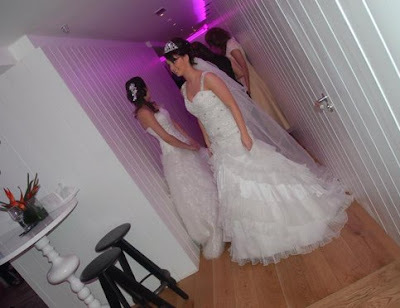 Love was in the air last week at 29 Glasgow (the city's luxurious private member's club) when style-conscious soon-to-be brides, seeking inspiration, descended on the venue for their Bridal Style Lab event. Guests were treated to cocktails and goodie bags on arrival, before being able to mingle and sample some of the delights on offer from experienced wedding cake supplier Cup Couture (www.cupcouture.co.uk). Brides interested in more than just traditional shaped wedding cakes, could also try their speciality- cupcakes, and their cake pops. These make for great little treats for wedding guests; and Cup Couture's are delicious! Whilst waiting on the catwalk show and presentations, the Style Lab attendees experienced delightful head, neck and shoulder massages from Clarins www.clarins.co.uk. Perfect for post-work relaxation! Clarins had a variety of their make-up and skincare range along with them so that the prospective brides could learn about what would suit them for their big day, and discover various application tricks from respected Scottish make-up artist Craig Alexander Wilson (www.createthedream.co.uk). After enjoying some of 29 Glasgow's canapes in the form of mini strawberry tarts and smoked salmon blinis, it was time for the fashion! 29 Glasgow's General Manager Michael introduced the proceedings and what 29 Glasgow could offer couples as a wedding venue. Scot Michelle Mone's company Ultimo (www.ultimo.co.uk) talked to guests about underwear, and how this choice is just as important as their wedding dress itself. Ultimo showed off their wide range of bridal lingerie and slim-wear; having something that would flatter and enhance all shapes and sizes on what will be one of the most important days of their lives. Fabulous Glasgow-based wedding dress designer and bridal boutique owner Susanne Christyne (www.susannechristyne.com) showed off her dress designs with the help of some beautiful models. As well as wearing Susanne's dresses, the models also showed off her stunning diamante hair clasps to illustrate the complete look that Susanne Christyne Bridal can create for their clients. To find out more about having your wedding at 29 Glasgow, visit www.29glasgow.com/weddings. All images taken by, and copyright of Twinkle Magazine (unless otherwise stated).